Caring Cutlery Especially For Those With A Weak Grip. 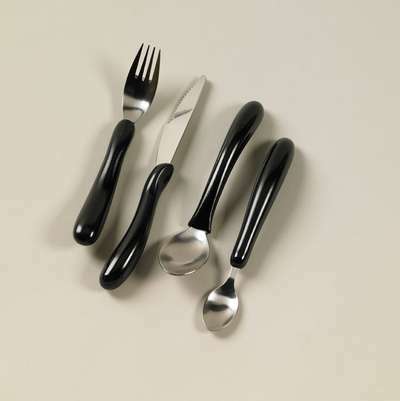 A set of stainless steel food utensils that have been moulded into contoured, ivory or black coloured handle; the Caring Cutlery range are especially for those with a weak grip, or restricted wrist or finger movement. The knife and fork have an indent on the top that allows the index finger to help with directional control, and the knife has a serrated blade that helps with cutting. A real encouragement to independent feeding! 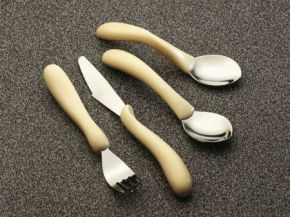 Available as a full set comprising of fork, knife, tea spoon and spoon, or can be ordered as separate items. I bought only the knives ,as having suffered a stroke, my husband found difficulty in cutting his food. Since using the caring cutlery this problem has been eradicated. The shape and weight are perfect for someone with limited dexterity. Great spoons. My mum loves them.